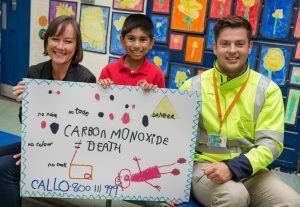 Cardiff pupil spreads carbon monoxide safety message to House of Commons. A Cardiff pupil has taken vital carbon monoxide (CO) safety messages to the House of Commons after winning a competition run by industry body Energy Networks Association, and supported locally by Wales & West Utilities. Marcos Fernandes age 7, who attends Llanedeyrn Primary School, was chosen as Wales & West Utilities winning Key Stage 1 Welsh entry of the ‘Get Creative, Be Safe’ competition. The safety competition, which was launched at the beginning of the year by Wales & ex-British Lions player Tom Shanklin, urged children aged 5 to 11 to produce an eye-catching poster, poem or entry in another medium which was both informative and accurate and raised awareness of the dangers of CO poisoning and how to avoid them. The competition is supported by all UK gas networks, including the gas pipeline and emergency service for Wales and the south west of England, Wales & West Utilities. 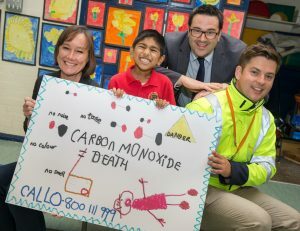 Marcos designed a poster which warned of the hidden dangers of carbon monoxide and included a signpost to the national gas emergency number – 0800 111 999. As the winning entry from his category, Marcos joined other regional winners at the House of Commons where he collected a trophy along with a £150 cash prize for himself and £300 for his school. Known as the silent killer because you can’t see it, smell it or taste it, accidental – and therefore preventable – CO poisoning is responsible for around 40 deaths, 200 hospitalisations each year. In the UK, there are more than 4,000 visits to Accident and & Emergency for treatment of CO poisoning – which can often lead to lasting neurological damage. Symptoms of CO poisoning are often confused with flu, especially in winter, as they include severe headaches, a sore throat, dizziness, coughing, feeling sick, and a general lack of energy. “Marcos captured key information about the hidden dangers of CO poisoning and he is a worthy winner. Wales & West Utilities, the gas emergency and pipeline service, takes pride in serving Wales and the south west of England. If anyone smells gas, thinks they have a gas leak, or suspects carbon monoxide poisoning, they should call us on 0800 111 999 and our engineers will be there to help, day or night.